Visit Seattle remains on top of the leader board for a second consecutive day, leading the Clipper Race fleet over the Equator and into the Southern Hemisphere for the first time. It’s a big moment for the teams, as the fleet will spend the next five months racing in the Southern Hemisphere, only crossing back over the Equator in February 2018 on the way to Sanya. Behind the two female Skippers, Qingdao and GREAT Britain are neck and neck, fighting for third. Qingdao is currently in medal position, though there is less than one nautical mile between the two teams. 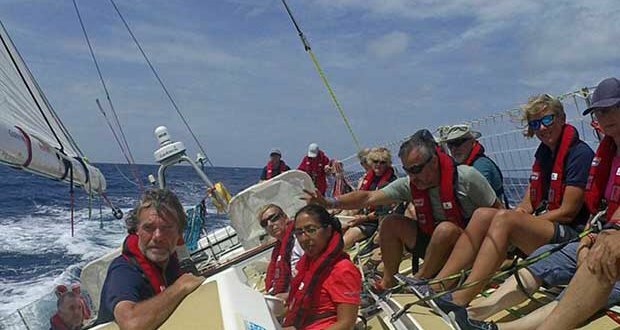 Qingdao Skipper Chris Kobusch comments: “It is surprising to see another Clipper Race yacht in the middle of the ocean after over 3000 nautical miles of racing. I think this shows the quality of the race, how hard it is to gain a position, and how easy it is to lose it again. Small mistakes go a long way. HotelPlanner.com is fifth, and Skipper Conall Morrison is just as happy with how his team of amateur sailors are progressing, as he is with where the team is placed, reporting: “Starboard Watch had the deck when the wind finally backed enough to allow us to make our preferred course towards the Brazilian coast, and we have cracked the sheets a couple of inches and are seeing boat speeds over nine knots average. In another showing of how close the race is coming out of the Doldrums Corridor, just 31.11 nautical miles separates Unicef from the ninth placed Liverpool 2018, whose Skipper Lance Shepherd reports: “We opted to head a bit further east than planned to try and find some wind and I guess I should have been careful of what I wished for, because we found the wind alright. We went from chugging along in casual 15 knot winds to flying sideways with winds of 35 knots in the blink of an eye.